Chuck D. Pierce: Embracing the Year 5768--Be Simple and Let this be the Year of the New Beginning! For years, I have always taken the Hebrew calendar and looked at the meaning of the numbers and prayed for my year to reflect His year! When we are serving the Lord and seeking His Kingdom plan, I believe each year brings new challenges and new joys for each of us. The Hebrew number system has always helped me as I focus each year on decreeing the "best" the Lord has for me and my family and those connected with me. I do not think you have to understand the Hebrew year to know the will of God. However, in Hebrew, numbers have word meanings, which have picture meanings, which have sounds. This brings a fuller perspective than just saying we have entered the year 2008. The Hebraic year 5768, which will encompass the Gregorian calendar's, Year of the Lord 2008 A.D., is the "The Year of Samekh Chet!" That means we are coming into "The Year of the Full Circle of Life--A New Beginning Is Yours!" Time is an interesting concept. God is not in time as we are in time. Our Father has access to every moment in our lives from beginning to end as though they were the present. By the Holy Spirit, we can actually access those times in our pasts when we felt abandoned, abused, betrayed, fearful, happy, fulfilled, or any other emotion or condition. Not only can the believer be forgiven for the past, he/she can also travel back in time with God, see Him as "a very present help" in the past, and redeem those past times that the enemy wanted to use for evil. Imagine for a moment that all of eternity is represented by a large piece of paper. This is where God is: unlimited by time and space. Now draw a line on that piece of paper that represents time with a beginning and an end. This line begins when God instituted time at creation, and it will end when God says, "Time's up!" Man lives on the line, while God can step in and out of time according to His purposes and plans. God sees all of time at once and doesn't have to wait for anything to happen; all is present for Him. This is a simplified explanation of a complex idea, but it works. We, however, must learn to respond to Him within time. We are called to represent Him as ambassadors in our generation. The decisions and actions we take now affect three generations ahead. Therefore, when we know how the Lord wants us to respond and we do so, His glory infiltrates the earth and we see Him change our atmosphere and environment. Because of God's position relative to time, He can--and often does--seem to answer our prayers before they have been uttered! God has chosen us as the necessary link to bring His will from Heaven to earth. He wants us to commune with Him, listen carefully to His voice, gain prophetic revelation, and decree that revelation into the earth. This will unlock miracles and release His blessings. Once we hear God, we can intercede. We can also prophesy. Prophecy is declaring His mind and His heart. When we receive prophetic revelation, we need to decree the prophetic revelation and then the atmosphere into which we decree goes on "Heaven's time" instead of "earth time." Issachar was the tribe that knew how to move into the new. They were a tribe that understood times and seasons. Consequently, I have tried to present that tribe in the earth today so God's children would know the times we are living in and what we should do to ready ourselves to advance in the earth. We entered a new season of war in the Hebraic year 5762. Before I share on the year ahead, I felt the necessity of reviewing the last several years. This will give you a good record of how we have gotten to where we are today. By looking at the Hebraic numbers, we can perceive the revelation we need to decree a new thing. Once we decree a thing, we then watch to see God's will manifest. Revelation builds! Revelation overcomes the gates of hell! Revelation gives us the keys to the Kingdom. 5762/2001-2002: The Beginning of Wars for 7 Years. This was ushered in with the tragedy of September 11, when the World Trade Center was destroyed by terrorist activities. This war over God's covenant plan in the earth began. The war over passing the mantle to the next generation began. 5763/2002-2003: A Sabbath Day Rest Year--A time of increasing faith; a year to ride the bull. Changing economic structures began and will fully manifest over the next five years. 5764/2003-2004: The Year of Samekh Hei! A year filled with secrets, mysteries and surprises; a year to run with the horses, gain new strength and roar louder than the roaring lion. 5765/2004-2005: A Year to Circle, Surround and Plunder the Enemy's Camp. A year of violent praise! A year of hurricanes! A time the wind of Heaven brought change in the earth. 5766/2005-2006: The Year of Samekh Vav! A year of staking your claim in the midst of the whirlwind. A time to overthrow old mindsets that have held you captive! 5767/2006-2007: The Year of Samekh Zayin! The year of seven is always a year of completion and fulfillment. This was a time to finish strong. The number seven, Zayin, is a sword with a crown. How you have overcome in the past season causes you to receive favor for your future! The sword is the Word so we are living in a time of the prophetic decrees! Hebrews equate the passage of time as the life cycle. The Hebrews saw man as participating in two time dimensions. One "age" of time was temporal. We were placed in nature and we interact with the laws of science around us. The other dimension of time was an age to come. 1 Corinthians 2:6-8 says, "However, we speak wisdom among those who are mature, yet not the wisdom of this age, nor of the rulers of this age, who are coming to nothing. But we speak the wisdom of God in a mystery, the hidden wisdom which God ordained before the ages for our glory, which none of the rulers of this age knew; for had they known, they would not have crucified the Lord of glory." Wisdom is available that God has stored for a time such as this. We can get to a place to gain wisdom that no enemy of hell has access to. From a Hebraic mindset, events that occurred through life created smaller styles of review of a bigger picture of life. When one summed up all of these smaller temporal cycles, the finite age was determined. We are living in a year of "summing up." We are not just living from year to year, but when you look at the season as a whole, you see the Lord doing something in our generation. He is preparing us to move more quickly and advance in Kingdom purpose in days ahead. The Kingdom Of God Is Moving Forward! "The Kingdom is ruled by grace and love--not by rules, regulations and laws." Kingdom life in the earth realm was used to help individuals understand the Kingdom of God. There are two terms throughout the Bible that we must embrace and understand: the "Kingdom of God" and the "Kingdom of Heaven." Anyone who willingly subjects themselves to the sovereign rule of a Holy God is aligned with Kingdom Principles. The "Kingdom of Heaven" represents the rule that God asserts on the earth at any given period in time. This is what links Kingdom understanding to time. John the Baptist, Jesus, and the Apostles all announced that the Kingdom of God was "at hand." As a matter of fact, the Lord said, "the Kingdom of God is within you." If this is so, then when the King moves, we must move with Him. The manifested rule of God on the earth is ever-maturing. The Kingdom of God represents God's rule in the earth realm. The King is moving us from "just going to church" to understanding His Kingdom in our territory. He is bringing us into a place of dominion, occupation, and ruling with Him in the spheres and places He has assigned us. Jesus taught so much on the Kingdom. The Kingdom is GOOD NEWS! Kingdom life was proclaimed throughout the three years that we have record of Jesus ministering in the earth realm, with His authority. The Kingdom is NOT based on needs, since "the poor will always be with us." Jesus gave us a responsibility to work with the poor, orphans, and widows, but on the other hand, He also showed us the necessity to lavishly worship Him as Mary did in John 10. The Kingdom cannot be controlled by civil government. Through the ages, civil government has made the attempt to govern and rule God's government in the earth. However, the Kingdom is not based on worldly patterns. Another important fact that we must all recognize is that we cannot comprehend the Kingdom by our natural mind. The mind is at enmity with God and longs to be conformed to the world around it. However, as we renew our minds, we break out of worldly conformity and move into seeing Kingdom life in the midst of the societal structures that are molding us. The Kingdom cannot be obtained by ambition. The exciting thing about the Kingdom is that it cannot be POSTPONED! The Kingdom is filled with power. Over these last two decades, we have seen Kingdom government for the next season of God in the earth realm. A Kingdom people understand Kingdom grace. The Kingdom is ruled by grace and love--not by rules, regulations and laws. God has appointed Kingdom administrators for every age. We find those gifts listed in Ephesians 4:11-14. You are being positioned to make a transition into the next realm of glory. Here are eight key issues that we can look forward to as we enter the Hebraic year 5768 and mature through the year ahead! First of all, the last two years actually come together to form this year's momentum. The two symbols of Vav and Zayin come together to form the symbol for Chet. In other words, the staking your claim and the sword with a crown actually join together to produce your new beginning. You will begin something new! Even if you refused to shift into a visible new dimension, your present state is your new state. With God, He will meet you where you are and cause you to start new if you yield! You can catch up quickly and gain momentum even if you have resisted change. If you do not yield, your new place will be your old cycle with the old structures reinforced seven times. The number eight is always linked with "new beginnings!" This Hebrew word is linked with life and being hot! We are entering into a year where we must choose to be hot, filled with passion, so we conceive our future! Choose the fire and the zeal of God! 1. This is a year of manifestation! There will be a physical manifestation of what you have been watching and waiting to see! 2. You can supernaturally transcend your limitations and begin your new era. 3. The land and the Heavens align to create a new Divine Presence in your atmosphere. 4. "Dominion" will be the key word for this year! Rule where you have been positioned. Rule or watch the "wild beasts" gain ground in your land. 5. This is a year that God's people will have great authority over their enemies. The nations against you can be driven out of your land! All squatters must go from your inheritance or they gain "squatters rights" and their encroachment will remain another season. Land is equated to the state of our mind. Therefore, this is the year to transform the mind so we have a new victory mentality in the war season we are living in. 6. Subdue your "animal impulses." Find your place of deliverance and do not let any wild beast enter your highway. Be aggressive to overthrow all poverty mentality! "A lion is on the road, I will hide myself," should not be your theme. Stand firm and face any transgression so you can move down your path! Isaiah 35 is a key for us this year. 7. Exodus 23 is also key this year. God forms His covenant with us to advance into our future destiny. This applies to families, regions and nations. If we have forgotten and rejected His covenant in areas, that will not be a part of our future. We must return and review our covenant roots and realign now! 8. Fasten yourself to the Lord. Don't let the enemy's hook drag you off the stage of your future! Break your orphan spirit! Return to a place of innocence! The secret place calls you forth. Stay in the secret place so you can be sent forth on key missions. The book of John and all of his Epistles are key for our transition this year. I am writing this article earlier than usual. However, I started thinking of the year ahead at Passover time this past year. I left early one morning and came to the office to seek the Lord. While I was meditating on where we had come from since September 2001 and the year of seven, and looking at various Biblical words linked with the number eight, my wife, Pam, called to share a dream. You should first know that Pam's favorite Scripture passage is Ephesians 5:8-16, "For you were once darkness, but now you are light in the Lord. Walk as children of light (for the fruit of the Spirit is in all goodness, righteousness, and truth), finding out what is acceptable to the Lord. And have no fellowship with the unfruitful works of darkness, but rather expose them. For it is shameful even to speak of those things which are done by them in secret. But all things that are exposed are made manifest by the light, for whatever makes manifest is light. Therefore He says: 'Awake, you who sleep, arise from the dead, and Christ will give you light.' See then that you walk circumspectly, not as fools but as wise, redeeming the time, because the days are evil." To redeem means to "buy back" or "to be released from prison." We have been in a buying--back season. This year we must receive the prize of our battles! This is the dream she shared: "I woke up slowly this morning, to the sound of singing birds, and it was as though I was walking through a curtain that divided the dream world from the waking world. As I lay there, I began remembering my dream: 'I was with a group of travelers, none of whom I recognized, but I knew they were important to me. We were told we had to take a trip, but we had no luggage, tickets or itinerary. We were standing in a hallway similar to one you might see in an airport, waiting for our departure. Suddenly, this strong wind began to blow down the hallway (wind tunnel) and push us toward the open end of the corridor. As we got closer to the end of the corridor, some kind of portal opened up, but it wasn't like what you see in the science fiction show, Stargate! The light was warm, and as we entered the portal area, we were disembodied and transported to another place. Strangely, the other place didn't look any different than the place we had just been. However, it was not the same place. We were inside a building, made mostly of glass. We all knew we had to fly to get where we needed to go. Well, none of us knew how to fly, but we just took off and started flying around the lobby. The people in the lobby were amazed and started reaching for us, saying they wanted to fly, too. We knew we needed more momentum to get to where we needed to be, so we landed softly, turned around, and got a running start before launching ourselves from a mini trampoline in the cafe area of the lobby. Instantly, we were outside the building, in a country setting, and we knew our mission: rescue a captive in the nearby village and bring him/her back with us. The mission itself is still vague, but I remember what happened when we were ready to return. One of the villagers wanted to go with us but knew it wasn't possible, so he gave each of us a tiny jewel case. Mine was a small, gold case encrusted with pearls. Inside the case were bits and pieces of broken jewelry: pearls, gold beads, crystals. Each case had a word on it. The word on the outside of mine was "Simplify." We thanked the one who gave us the gifts, then turned to launch back into the sky for the return trip. That's when the birds woke me up." 5768 Will Be A Year Of Momentum! The year ahead will not only be a year to begin a fresh season in your life, but 5768 will be a year when the Body of Christ gains momentum. An object with momentum is difficult to stop. To stop such an object, it is necessary to apply a force against its motion for a given period of time. The more momentum which an object has, the less likely to stop its forward motion. Thus, it would require a greater amount of force or a longer amount of time (or both) to bring an object with more momentum to a halt. As the force acts upon the object for a given amount of time, the object's "velocity" is changed. When a force acts for a given amount of time, an object's "momentum" changes. If the force acts opposite of the object's motion, it slows the object down. If a force acts in the same direction as the object's motion, then the force speeds the object up. Either way, a force will change the velocity of an object. This will be a year when forces vie for momentum. God will be moving on us! Will we respond to Him? The enemy forces that we have not resisted will be moving with force to slow down a Kingdom that is advancing in the earth realm. We must bind the strongman's operation and gain access to the spoils. We must start moving as the people of God did when they left Egypt and keep moving until we reach the manifested Promise for this generation. We must not allow the voices of fear, unbelief and doubt to stop us from advancing. There will be three 40-day periods when we overthrow major strongholds that are holding treasures captive. 5768 Will Be A Year Of Impulse! In physics, force when multiplied by time equals the mass multiplied by the change in velocity. This is known as impulse. Impulse is one body, individual or kingdom working against another. Impulse is the effect of force being communicated. This results in motion. Once things get in motion, they are hard to stop. The Body of Christ will advance with great momentum in the year ahead! Impulse can be very negative. We must know what is driving us. The Holy Spirit must be preeminent in our lives. The year of 5768/2008 will be the year that we are driven to accomplish our desires. This will be a year that supernatural power has access to mankind. We must stay under the influence of the Holy Spirit or else other spirits will drive us to agree with the plans of darkness in the earth. The violent are taking the Kingdom of Heaven by force. There are certain changes in the earth that have occurred in the last seven years and have created motion that cannot be stopped. The kingdom of darkness must give way to the Kingdom of God that is advancing with new strength. The supernatural power of God being released on His people is creating much motion and change in the earth. We are under the impulsion or driving force of a King who wants to see change in the world today. We must gain momentum now! As we learn to move in our proper spheres of authority in the earth realm, we will harness God's power and then release that power. The year ahead will be a transforming year for God's people. Once we are transformed, we will see cities, regions and nations changed. Harvest fields that are ripe will be entered with great enthusiasm. Do not let carnal impulses guide you! God will visit you in time. Be expectant to watch for His coming visitation in your life. We are a people on the move. God has a Kingdom that is within us. The Kingdom of God is advancing. We are moving from fellowship into war. We are moving from praise to jubilation as we see a manifestation of His promises in our life cycle. This is a year of transcending and taking back what has been held in captivity. However, remember Pam's word, "Simplify," to go back and forth with ease until the new is established. To summarize, this will be the year to "Go through the eye of needle!" Remove all and get through your narrow place and into the new! This article appeared on the ElijahList on August 28, 2007. In October of 2004, I was on the phone with a close friend of mine who was working at Destiny Image as an editor. I told him that I was looking for a fresh new book for my spiritual father. Justin made mention of a book that had created quite a stirring at Destiny Image since it had a prophetic edge that was undeniably a must read—Praying Faith by Dr. Tom Dooley. I was unfamiliar with this book and author, but I did make a mental note of it. A few days later I purchased the book with the intention of sending it to Jerry Phillips for his birthday. Jerry never received the birthday present. After purchasing the book, I started reading it and I couldn’t put it down! The Holy Spirit gripped my heart as I read through the book concerning life adventures in faith of this scientist, entrepreneur, and minister. I cried out to Lord for greater faith and authority in my own life. My heart was stirred! Then in 2006 I reread the book. At that point I sensed the Lord prodding my heart that I was to connect with Dr. Dooley. I couldn’t explain it fully, but I felt that it was imperative that I make contact with him. The Lord led me to thank him for his book through a letter and I was able to express how the book had impacted my own life. Since then we have communicated frequently and met face-to-face once in Washington, DC. Now I consider Dr. Dooley to be a precious friend and a mentor to me. In two weeks I will be traveling to Chicago, Illinois to assist Dr. Dooley as he ministers as a keynote speaker at a conference hosted by Redeemed & Empowered Teaching Church. Pastors John and Cherry Rice have also invited Peter Randall of Monument of Faith in Chicago as a keynote speaker. And Dr. Dooley has assembled a team of Path Clearer associates who are gifted prophetically to provide additional ministry to the participants during the conference. Or you can call Redeemed & Empowered Teaching Church directly at 708.351.9259 for additional information. Please consider contacting anyone who lives in the Chicago/Illinois area that may have an interest in attending The Gift of Prophecy conference. By the way, Jerry did get a copy of Praying Faith and he also devoured it. Dr. Dooley was gracious enough to send him a signed copy! I want to share a prophetic word that I received today through Sally Green that is intended for the body of Christ at large. My wife and I met Sally when we were studying at Christ For the Nations Insitute in Dallas, Texas. She was on the faculty at CFNI and a leader in the prayer ministry on the campus. I always enjoyed her classes due to the passion that she had for the Lord and for the call to prayer. When she spoke on prayer, she was speaking out of a deep reservior of life experiences pursuing the Lord in the secret place. She had authority. I felt that it was important for each of you to hear the Word of the Lord through her for this hour. Remember, it is NOT time as usual! I first saw an oil drill drilling down into the rock. Then I heard: "IT IS NOT TIME AS USUAL! It is time to get MORE OIL in your lamps...Darkness is coming like you have not known before in your country...You need more oil NOW. Not a lot of time but some time.. Oil comes from personal time with me. A day is coming where you must hear 'This is the way walk you in it.' A day where I will say 'Do not go down that street. Do not go the normal familiar way. Go this way...Wise Virgins do not be distracted by the normal." I also heard the Lord say "There is only one who has done it all right! Do not let your failures hold you back from coming into My Presence to get the oil. Come through My Son! Put your claim on the Oil I have provided for you." Isaiah 30:21 Your ears shall hear a word behind you, saying, "This is the way, walk in it," Whenever you turn to the right hand Or whenever you turn to the left. Isaiah 30:22 You will also defile the covering of your images of silver, And the ornament of your molded images of gold. You will throw them away as an unclean thing; You will say to them, "Get away!" Psalm 112:4 Unto the upright there arises light in the darkness; He is gracious, and full of compassion, and righteous. Psalm 112:6 Surely he will never be shaken; The righteous will be in everlasting remembrance. Psalm 112:7-8 His heart is established he will not be afraid of evil tidings; His heart is steadfast, trusting in the LORD; He will not be afraid, Until he sees his desire upon his enemies. As for me, it takes me awhile to communicate...I am still trying to get replies and correspondence done that is nearing a year old. Major sickness like battering rams gets my time knotted up and then I do not catch up. My life is mostly full of "Undercover work" for the Lord! Or I like to say, sort of like the trench warfare of WW1...Not that bad of course....when I am tempted to be discouraged through days of warfare, I remember I am not in the trench of WW1 or the concentration camps of WW2. That keeps me in a Holy perspective. For all of us the great words of Winston Churchill would be good to remember for now and in the near future, "Never, Never, Never give up!" And then the MUCH GREATER WORDS of Our Lord Jesus ...Men ought always to pray and not lose heart. I leave you and myself with those words. You are always in my heart. In the past month we’ve been talking about spiritual fathering. Possibly you are one who is a young person who desires intensely to be fathered and mothered in the faith. Or possibly you know someone in your sphere that fits the description and is looking for an opportunity to receive such from a wise and seasoned veteran in the faith. Such an opportunity exists at Grace Church of Fredericksburg through the avenue of the Year of Your Life (YOYL), which is a one-year, full-time course that focuses on preparing you for life. This discipleship school was started by a lovely couple who are committed to reaching and preparing the emerging generation for their calling—George and Lynn Ainsworth. 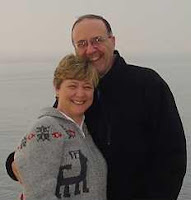 George and Lynn have extensive ministry experience that enables them to effectively minister to young adults. My wife and I have a young lady in our community group who completed the program this past year and she loved it! The course combines solid biblical teaching, a life-challenging curriculum, personal accountability and practical experience to facilitate a year of intense discipleship. The year long program centers on a intimate relationship with God, personal restoration, character development, relating to others, finding your purpose, outreach, and career guidance. The leaders of YOYL try to create a context where each person is personally transformed by the power of the Holy Spirit. Overall I've been impressed with the students as I've watched them within the context of our church. Please prayerfully consider this school if you are a young adult or if you know somebody who needs to invest a year of their life to allow the Lord to do a deep work! The leaders of YOYL identifies the following as key objectives they aim to pursue: (1) Disciple people to make an impact in this world (2) Bring people to wholeness by fostering a vibrant relationship with God and laying solid foundations in God’s Word. (3) Send people from us who are equipped to make a difference in the world around them. The leadership of YOYL strive to develop godly character in the lives of their students through times of worship, ministry and teaching. The focus is on discipleship, training each young adult to think and act in accordance with Biblical principles. Intimacy with God (Matthew 22:37)—Above all else we are to know God and love Him with our whole being. Students are encouraged to allow God to show them the extent of His love and Father’s heart by yielding to the work of the Holy Spirit in their lives. Character Development (2 Corinthians 3:18)—The students will be given the opportunity to grow in character, through a curriculum designed to challenge their “Christ - likeness”, and to learn relational skills. The interaction of students in small groups and personal mentoring by their Small Group Leader provides a vital foundation for personal discovery and change. Servanthood (Philippians 2:3-7)—“…in humility, consider others better than yourselves…” Daily chores in the student homes allow students to start by serving each other. Practical outreach in assisting the ministry staff of Grace Church of Fredericksburg, serving other local churches across the mid-Atlantic region, and aiding various community projects establishes this attitude in students’ lives. Studying and applying the Bible (2 Timothy 2:15 & Romans 15:4)—Students embark on a ‘Bible journey’ where they are given a good overview of the Bible and taught to work with the various literary types in the Bible. In learning to handle the Bible correctly, students will be taught basic principles of biblical study and interpretation skills. Outreach and Evangelism (Matthew 28:18-20)—In heeding Jesus’ call to “Go and make disciples…” students are given the opportunity to impact their community through weekly service to the homeless, those in prison, nursing homes, community projects, and schools. Through short-term outreaches, students also assit various ministries across the Mid-Atlantic region, and also experience cross-cultural ministry through international short-term mission trips to Europe or Latin America. Culture—Our students are mostly young people, just out of high school or college. This leads to a vibrant atmosphere at all times. Lifelong friendships are established. We endeavor to create a culture of solid biblical teaching, personal accountability and practical experience to facilitate a year of intense discipleship. The year centers on relationship with God, personal restoration, character development, relating to others, finding your purpose, and career guidance. You are guaranteed to change and will be trained to make a difference in the world around you. Training takes place in a multi-cultural environment. This diversity is key to helping us understand God, His people and His world better by learning from those with different perspectives from our own . Involvement in the Local Church—While in Year of Your Life, students will be an integral part of Grace Church of Fredericksburg. so as to give them a hands-on experience of the impact that a local church can have within its community. Students are required to actively participate in the various ministries of Grace Church of Fredericksburg. There are also opportunities to become part of various ministries. such as children’s and youth ministry, assisting with altar calls and baptisms, ushering, praise and worship, prophetic ministry, a variety of community-based ministries and more. Click here to view application and other information on the discipleship program. I wrote a response to Brian Heasley’s blog that turned into something far more than just a short reply. In this blog posting, Brian bears his heart concerning the feelings of shame that he encounters in life. Unfortunately shame is an issue that I am well acquainted with—which, explains why I was intrigued by the Heasley's stories and brute honesty. Even today shame seems to raise its tormenting head to whisper lies into my soul. Do I listen?—well, I try not to. Often it is simply a “feeling” that swarms me at moments of vulnerability and personal letdowns. For many years it was a constant companion, reminding me of my every shortcomings and failures. Literally it drove me to the edge. Interestingly five years ago when sharing with a prophetic gentleman concerning the suicides of my biological father shortly after my birth and the suicide of his father several years previous—this man-of-God said, “It was shame the drove him to end his life.” Although one could argue that we don’t know with absolute certainty, I certainly couldn’t refute this statement and it did bear witness with my spirit. I believe the Lord desired to uncover a generational curse that has sought to “steal, kill, and destroy” (John 10:10) the fullness of God’s calling upon my life.